The Changing Role of Office 365 Admins (Video) April 19, 2019 8:25 am- No one can say that the role of an Office 365 admin is static. In fact, it changes all the time as new technologies appear or Microsoft changes existing applications. This video featuring MVPs Paul Robichaux and Tony Redmond explores the changing role of Office 365 Admins, and sometimes it even makes sense. Unified Labelling Version of Azure Information Protection Client Now Generally Available April 18, 2019 7:55 am- Microsoft has released the GA version of the Azure Information Protection client, which reads information about Office 365 sensitivity labels and policies from the Security and Compliance Center. It's one more step along the path to making it easy for Office 365 tenants to protect their data. Work still has to be done, but at least we can see light at the end of the encryption tunnel. Microsoft’s “New Migration Experience” from G Suite to Exchange Online April 17, 2019 10:07 am- Microsoft announced a new migration experience from Google G Suite yesterday, which is nice. Under the covers, the venerable Mailbox Migration Service (MRS) does the work to extract mailbox data from Gmail using IMAP4 and moves it to Exchange Online. But after the move is done, there's still lots of work to do to help users make the cultural change to their new mailbox in the cloud. Teams Hides Underused Clutter From User View April 16, 2019 6:59 am- Office 365 notification MC177587 tells us that Teams will soon start to move underused teams to the More section of the teams gallery, letting users concentrate on the set of teams that they really use. Background agents do the work of detecting teams that haven't been accessed in 45 days or so and users get the chance to reverse the process. But it's a good idea to let users know what's coming, just in case they panic when they can't find a moved team. 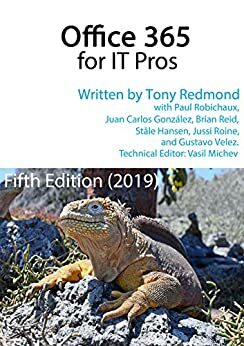 Office 365 for IT Pros April 2019 Update Available April 15, 2019 10:42 am- Update #13 for the Office 365 for IT Pros (2019 edition) eBook is now available for subscribers to download from Gumroad (EPUB and PDF) or Amazon (Kindle). This update features changes in 14 of the 24 chapters, so it's substantial. Just like Office 365, the book keeps on changing to keep track with new developments, best practice, and information released by Microsoft. OWA’s ThirdPartyFileProvidersEnabled Setting April 12, 2019 10:01 am- The ThirdPartyFileProvidersEnabled setting in OWA mailbox policies controls if Exchange Online mailboxes can access services like Drop and Dropbox for attachments. Office 365 tenants need to decide if they want to allow this kind of access. There's both good and bad in the feature, but it's easily turned off if you feel the need. Users Can Propose Others for Membership of Private Teams April 11, 2019 10:55 am- Office 365 notification MC177013 gives the news that team members can now nominate other people to join a private team. Teams routes the requests to team owners, who approve or deny access. It's a small but useful update. Teams Admin Center Adds Delete and Archive Capabilities April 10, 2019 7:53 am- The Teams Admin Center now boasts the ability to delete teams and (if you don't want to get rid of them altogether) archive teams. And unarchive teams back into use. All is good, even if Microsoft is making slow progress at building out Teams management functionality. Some of the slowness is due to dependencies, some because of other factors. Outlook’s Background Moves April 9, 2019 5:55 am- It's hard for a program that's been around for 22 years to surprise, but Outlook has done it by introducing background moves. The implementation is good and it closes a gap that's existed in Outlook for a very long time. So long that most Outlook users probably assumed that the program would never mend its ways. But then again, because people don't move items between folders like they used to, perhaps no one cared. The Case of SharePoint Online’s Missing Retention Labels April 8, 2019 10:11 am- Sometimes Office 365 can be infuriating. My latest tribulation came in the form of missing retention labels, which disappeared from SharePoint Online without any reason for two weeks. Some labels returned due to auto-label policies, but any applied to documents manually had a vacation somewhere in the bowels of the services. It wasn't a good experience. Ratings and Reviews for the Office 365 for IT Pros eBook April 5, 2019 9:18 am- The Office 365 for IT Pros writing team don't pay too much attention to ratings we receive on different sites. However, we love getting comments to tell us how we can improve. If you've got something to share with us, please send a comment on this site or on Facebook. Microsoft Halts Deployment of MailItemsAccessed Audit Records April 4, 2019 9:53 am- Announced in January, paused in March - that's the fate of the MailItemsAccessed audit record generated by Exchange Online for the Office 365 audit log. Microsoft found some problems that they are fixing, which is good (because you want audit data to be reliable). And when the fixes are available, the deployment of the new audit record will restart. Microsoft 365 Security and Compliance Centers Now Generally Available April 3, 2019 1:34 pm- The Microsoft 365 Security and Microsoft 365 Compliance Centers are now generally available. The new consoles will eventually replace the Office 365 Security and Compliance Center (SCC) but some work is needed to fill out their functionality and make the switchover possible. In the meantime, the Office 365 for IT Pros eBook writing team will stay focused on the SCC. And when the time's right, we'll switchover. Why Teams Doesn’t Delete the SharePoint Folder When Removing a Channel April 2, 2019 6:28 pm- The tabs in a Teams channel can be associated with many different forms of data. When you delete a channel, you only remove the conversations for that channel. Any other data is left intact, including files in the folder in the SharePoint site used by the team. To fully clean up a deleted channel, you must therefore check what tabs exist and what data is accessed through those tabs. The Irritation of Exchange Online’s Inconsistent Mail Tips April 1, 2019 10:15 pm- MailTips are a pretty useful way of drawing the attention of users to potential issues with email. Exchange Online supports several MailTips, but Outlook clients insist on supporting MailTips in different ways. It's a small but irritating part of Exchange Online that could be done better. Teams Praise Rolling Out to Bring Happiness to All March 29, 2019 1:07 pm- Office 365 Message Center update MC176548 says that Teams has started to roll out "Praise" a way of sending another user a graphical reminder of how much you appreciate their work. Undoubtedly, praising people in Teams will make the world a happier place. Adding Multiple Office 365 Users with the Microsoft 365 Admin Center March 28, 2019 10:07 am- The Office 365 Admin Center offers the option to bulk-create user accounts. Loading up a CSV file with details and having it processed is simple enough, but the resulting accounts need some work before they are fit for purpose and ready for people to use. Here's how the bulk creation process works and why we think it has some flaws. Finding the SharePoint URLs for Teams March 27, 2019 12:09 pm- Every Office 365 group (and team) has a SharePoint site. But how to find the URLs of all the sites used by teams in a tenant. One PowerShell answer came from Syskit, but it's an old technique and we can do better now by fetching a list of teams in the tenant and then retrieving the URL for each team-enabled group. Making Sure Everyone’s Covered by an Office 365 Supervision Policy March 26, 2019 9:33 am- Although Office 365 supervision policies are intended to monitor a subset of user communications, usually involving specific groups of people, you might want to use a policy to monitor all email. In that case, how do you make sure that your policy has everyone in scope? The problem is that supervision policies don't support dynamic distribution lists, so you need to do some work to build and maintain a distribution list containing all user mailboxes. Office 365 Exposed Episode 14 Now Available March 25, 2019 9:21 am- Last week, we taped episode 14 of the Office 365 Exposed podcast in Building 27 of Microsoft's HQ in Redmond. Topics covered include battling attacks on Exchange, the need to upgrade old Exchange versions, Teams announcements at Enterprise Connect, and how the base Office 365 workloads handle retention storage. We think it's an interesting episode. Get it from iTunes now! Using Teams External Access for Federated Chats March 22, 2019 4:26 am- Teams supports federated chat with other users in Office 365 tenants using a feature called external access. It's similar to the way that Skype for Business federated chat works, except that you can't use emojis. Generally things work very well, which is nice when you want to reach out and communicate with someone externally. Using Office 365 for IT Pros with Google Play March 21, 2019 2:41 pm- A subscriber reported that he couldn't use the EPUB version of Office 365 for IT Pros with Google Play. We can make the EPUB work, but only by converting it to MOBI and back to EPUB. It's better to use the PDF version with Google Play. This works and you get better formatting of tables and code examples. Office 365 Content Search Actions and Hard Deletes of Mailbox Items March 20, 2019 3:03 pm- Office 365 content searches now support a hard-delete (permanent deletion) option for the purge action, but only for mailbox items. You can purge up to 10 items at a go. If you have more to purge, you just have to keep on purging until everything is gone. Or use the Search-Mailbox cmdlet, which keeps on proving its usefulness to administrators who need to remove lots of mailbox items quickly. Teams Usage Hits Half Million Organizations March 19, 2019 5:39 pm- At the Enterprise Connect conference, Microsoft announced that Teams is now used by 500,000 organizations. That's a jump of 80,000 since the last data given in January. They also said that 150 organizations have more than 10,000 users and that Teams is used by 91 of the Fortune 100. All in all, some impressive numbers. Eliminating Basic Auth for Exchange Online with AAD Condition Policies March 18, 2019 2:08 pm- Exchange Online protocol authentication policies control what protocols a user can connect to mailboxes with, but it would be much better if we didn't have to worry about some old and insecure protocols. Azure Active Directory gives Office 365 tenants the chance to clamp down on IMAP4 and POP3 connections and close off some of the holes that attackers try to exploit. Microsoft says that this can lead to a 67% reduction in account compromises, so that's a good thing. Office 365 for IT Pros March 2019 Update Available March 15, 2019 10:24 am- The March 2019 updates for the Office 365 for IT Pros eBook are now available for EPUB/PDF and Kindle versions. EPUB/PDF subscribers can download the updated files from Gumroad. Getting the updates for Kindle is slightly more difficult, but it's possible and explained in our FAQ. Twelve of twenty-four chapters are updated in this release, so please take advantage of our work and download the updates now. Flagged Messages Might Make To-Do a Great App March 14, 2019 10:28 am- Microsoft To-Do now boasts the ability to process messages flagged by Outlook as tasks. It's a great way to handle complex tasks that arrive in email, so Office 365 users might like to give To-Do a second look. The steps feature makes it very easy to build checklists of stuff that needs to be done to accomplish tasks. Sharing SharePoint and OneDrive Documents with LinkedIn Contacts March 13, 2019 2:52 pm- A new feature makes it easier for Office 365 users to share documents in SharePoint Online and OneDrive for Business libraries with LinkedIn first-degree contacts. The LinkedIn folks are now included in the suggested people list. It's much easier to pick someone from a list than to look for their email address (which might be out of date). Before you can share with LinkedIn, your Office 365 tenant and user account must be configured to support the connection. Planner Can Now Copy Plans March 12, 2019 3:38 pm- Microsoft has announced that Planner now boasts the ability to copy a plan. Apparently, the idea is to save time by setting up plan templates that you can reuse. Office 365's task management app might not get as much love as other apps, but this is a useful set forward. Only users who are allowed to create new Office 365 groups can copy plans. Office 365 Groups Naming Policy Now Generally Available March 11, 2019 11:32 am- The Office 365 Groups Naming Policy is now generally available. The policy has taken nearly two years of preview to not get very far, but at least it's now an official part of the service. Microsoft considers the naming policy to be an Azure Active Directory Premium feature. Many customers might think differently, especially because the naming policy must be implemented through PowerShell and can easily be mimicked through PowerShell. And of course, Exchange Online's distribution list naming policy is free. Read More "Marking External Email with an Exchange Transport Rule"
The End of Teams Following and Favorites March 6, 2019 7:22 am- Microsoft announced that the era of favorites and following is over for Teams. The new way is to show or hide teams and configure notifications for channels. Apparently, people found the old terminology confusing. Hopefully the new world of Show/Hide and Channel notifications will be more reassuring. New Office 365 Admin Center Offers to Create DLP Policy March 5, 2019 11:14 am- In a sign of how automation based on signals gathered by Office 365 will emerge to help administrators do a better job, the preview of the new Admin Center offered to create a DLP policy to protect some sensitive information that I had clearly overlooked. Well-intended as the portal was, its efforts to create the new policy failed. That's not really important - it's the glimpse into the future which is. Teams User Count Outpaces Slack and Workplace March 4, 2019 11:12 am- New data about the number of Slack and Workplace usage gives the chance to compare how Microsoft is doing with Teams. And the answer is that things seem to be going well, largely because Teams is growing off the huge Office 365 base. With 155 million users (the last figure) and 3 million more added monthly, Teams has a lot more to go after in the Office 365 installed base. Configuring PowerShell for Office 365 March 1, 2019 3:13 pm- If you work with Office 365 through PowerShell, you probably have your own script to connect to the various services. If you don't want to write your own script, you can download one from GitHub or the TechNet Gallery. This article covers two that you might like to try, including one with a GUI to choose which Office 365 services it should connect to. Automating Office 365 with PowerShell and Flow February 28, 2019 8:09 am- PowerShell is hugely useful when the time comes to automate Office 365 processes. Other tools exist that can help, including Flow. Maybe it's the right time to consider Flow, especially when it is highly capable of knitting together different Office 365 components to get work done. The Great SharePoint Online Recycle Bin Fallacy February 27, 2019 11:36 am- If you're interested in deploying backups for SharePoint Online, you might be doing so to prevent data loss through accidental user deletion. However, Office 365 retention labels and policies can help prevent accidental deletion too. And the best thing is that retention policies and labels are part of Office 365 E3, so you don't have to pay more to get protection. Office 365 Sensitivity Labels: Auto-Label and Updated Client February 26, 2019 2:44 pm- Microsoft released an update for the unified labeling version of the Azure Information Protection client needed for Office 365 sensitivity labels, which now boast auto-label support. Solid progress is being made to move sensitivity labels to the point where they are considered to be generally available, probably later this year. In the meantime, pay attention to the premium features like auto-label which require more expensive licenses. New Information Protection Service Plans for Office 365 February 25, 2019 2:11 pm- Microsoft announced that the Office 365 E3 and E5 plans will receive new Information Protection licenses. They're preparing for the introduction of sensitivity labels and the increased use of encryption to protect access to content in Office 365 apps like SharePoint Online, Exchange Online, OneDrive for Business, and Teams. You don't have to do anything to prepare for the new licenses, but it's nice to know what they are and how the licenses are used. Publishing News in Office 365 with the SharePoint Online News Digest February 24, 2019 11:07 am- SharePoint Online supports the ability to create and publish a news digest from news items published on a site (or sites associated with a hub site). It's a great way to spread information within an Office 365 tenant. Microsoft Launches Series of Outlook Mobile Seminars February 22, 2019 6:46 am- Microsoft will deliver a set of five seminars about Outlook Mobile starting on March 14. It's always good to gain some knowledge about an important technology. Outlook Mobile is important to Office 365 because it is the most functional email client available. If you don't believe me, attend some of the seminars and make your own mind up. Analyzing the Teams Outage of 18 February 2019 February 21, 2019 12:06 pm- Microsoft Teams suffered its first major worldwide outage on 18 February 2019. Users reported a failure to connect because Teams couldn't authenticate them. The Post-Incident report for TM173756 revealed an issue with the Azure Key Vault. What's more interesting is that the issue affected users in multiple Office 365 datacenter regions, which is not good. Phishing: Your Document Has Been Completed February 20, 2019 12:43 pm- Phishing attacks through email happen all the time. A new relatively crude one arrived today. It's easy for the trained eye to detect phishing, but do your Office 365 admins know how to use the tools available in Exchange Online Protection to suppress malware, and do your users know the signs of bad email? In this case, it's an invitation to click to get to a PDF document to bring you to digitaloceanspaces.com. Some interesting things might happen afterwards, but I really don’t want to find out what occurs when I click the link. Office 365 Captures Audit Records for Teams Compliance Items February 19, 2019 2:40 pm- In one of those interesting (but possibly worthless) facts discovered about Office 365, we find that audit records are captured for Teams compliance records written into Exchange Online group mailboxes. The Search-UnifiedAuditLog cmdlet reveals details that we can interpret using some techniques explained in Chapter 21 of the Office 365 for IT Pros eBook. Office 365 for IT Pros February 2019 Update Released February 18, 2019 1:59 pm- Update #11 for the Office 365 for IT Pros eBook is now available. Subscribers can download updated files from Gumroad or Amazon Kindle (depending on which version you bought) and benefit from the 16 updated chapters. ePublishing is the only way to keep up with the volume of changes in Office 365, and Office 365 for IT Pros is the only book that keeps up. But you know that anyway because you're reading this site! Who Will Lead Your Office 365 Deployment? February 17, 2019 8:46 pm- A recent Petri.com article set out the case that the technical lead for Office 365 deployments is best found in the ranks of people experienced with Exchange.The uphot was a flurry of tweets where people who worked with SharePoint and Skype explained their (strong) feelings on the matter. The upshot was an online debate to explore the attributes of people who lead successful Office 365 deployments. You can listen to a recording online. Microsoft 365 Licensing, Yammer and Teams, Office DPIA, and Exchange February 15, 2019 1:30 pm- Office 365 changes all the time, which is good because it keeps the Office 365 for IT Pros writing team busy and happy. Discussions this week included Microsoft's response to a Dutch DPIA, the effect large Teams have on Yammer, how Exchange Online validated a fix to a security problem, and graphics to help understand the components of the Microsoft 365 E3 and E5 plans. It’s Now the Teams Admin Center… And Some New Teams Usage Reports February 14, 2019 12:30 pm- The Teams Admin Center has been renamed to remove any reference to Skype for Business Online. The console now includes a set of new Teams usage reports. The reports differ from what's available in the Office 365 Admin Center and aren't quite as powerful, but we can expect Microsoft to improve and refine these reports over time. Azure Active Directory Still a Weakness for Office 365 February 13, 2019 10:49 am- The January 24-25 Azure Active Directory outage demonstrated once again how important AAD is to Office 365. Microsoft's Post Incident Report tells us what happened to deprive 1% of the users in Europe of service. That doesn't sound a lot, but you'd be mad if you were affected. Using Search-Mailbox to Process Multiple Mailboxes February 12, 2019 12:14 pm- The Search-Mailbox cmdlet is a very powerful weapon for Exchange administrators. It has some quirks, but the Invoke-Command cmdlet helps us get around one, which is how to use a different search query for each mailbox processed in a set of mailboxes. Setting Free-form Status Messages for Teams Users February 11, 2019 11:05 am- Teams users can now set their own status message to inform co-workers about what they're up to for the next few hours, days, or on an ongoing basis. It's a small but useful feature that seems to have crept into Teams without much publicity! Office 365 Exposed Episode 13 Now Available February 8, 2019 9:34 am- After a brief hiatus, the recording for episode 13 of the Office 365 Exposed podcast is now available. We think it includes some interesting topics and the arguments aren't too heated. See what you think and let us know in the comments. Teams Membership Limit Raised to 5,000 (per team) February 8, 2019 9:00 am- Microsoft revealed that Teams now supports a increase to 5,000 members per team. The new maximum will help large organizations like Accenture (the largest user of Teams). Even with the increased limit, Teams might not be the best choice for organization-wide communications for the largest companies. Yammer is still the Microsoft coillaboration scalability champ. Exchange Page Patching and Native Data Protection in Office 365 February 7, 2019 10:08 am- Some backup vendors think that corruption can lead to data loss within Office 365. The possibility exists, but the page patching mechanism for databases incorporated into Exchange Online DAGs makes corruption a lot less likely, especially when mailboxes are protected by four database copies and Exchange applies many other techniques to ensure the consistency of the databases. New OWA Now Generally Available to Office 365 Tenants February 6, 2019 8:59 am- The new version of OWA (sometimes called Outlook on the Web, or Outlook Web Access) is now generally available to all Office 365 tenants. Although the new OWA has some nice features, you might want to turn off the user choice (toggle) to move the new UI until you've had time to prepare the help desk, documentation, and that sort of thing. Cloud App Security Alerts Flow into Office 365 Audit Log February 5, 2019 12:42 pm- Security alerts from Office 365 Cloud App Security now flow into the Office 365 Audit Log, which means that you can run the Search-UnifiedAuditLog to find the alerts. Unhappily, more work than should be needed is necessary to extract the interesting information from the alert records. Exchange Online Transport Rule to Encrypt Sensitive Email February 4, 2019 12:31 pm- Microsoft has released details of an Exchange Online transport rule to encrypt outbound email containing sensitive data types like credit card numbers. The rule works (after fixing the PowerShell), but needs to be reviewed and possibly adjusted to meet the needs of Office 365 tenants. Teams Compliance Records Focused on by New Report February 1, 2019 10:29 am- A new report commissioned by Microsoft explains how Exchange Online and the Security and Compliance Center meet the electronic records requirements of regulatory bodies like the SEC and FINRA. Within the report, there's some news about changes to the way that Office 365 handles Teams compliance records stored in Exchange Online. And after all that, we consider how some backup vendors treat Teams compliance records as equivalent to the data stored in the Teams Azure services. Teams Growth Accelerates to 420,000 Organizations January 31, 2019 2:11 pm- According to Microsoft's FY19 Q2 results released on January 30, Teams is now used by 420,000 organizations. That's a strong growth rate over the 329,000 number given at Ignite 2018. And with Office 365 still growing, there's plenty of room for Teams to expand. Good and Bad Marketing (Technical) Blog Posts January 30, 2019 12:49 pm- The internet makes it easy to find material to read about technical topics. Unfortunately, a lot of content is rubbish. In this post, we compare two recent technical articles and explain why we think one marketing post is good and the other isn't up to scratch. Email One-Time Passcodes for Azure Active Directory January 29, 2019 1:28 pm- Microsoft has launched email one-time passcodes (OTP) into preview for Azure Active Directory guest accounts. It's all to do with better collaboration. OTP doesn't support Teams, Planner, or Office 365 Groups yet, but it can be used to share documents from SharePoint Online or OneDrive for Business. Tuning PowerShell for Office 365 Group Membership January 28, 2019 11:07 am- A recent article prompted a check to see whether a PowerShell recommendation made sense and delivered better performance when executing a command to extract the membership of Office 365 Groups performance. As it turns out, the recommendation is valid, but whether you notice any difference is arguable. Exporting User GDPR Data From Delve January 25, 2019 10:18 am- Delve has options to export user information that seem to have been added to help Office 365 tenants comply with Article 15 of GDPR. Unhappily, the export is rudimentary and the JSON information will be impenetrable to normal human beings. Exploring SharePoint Document Identifiers January 23, 2019 11:38 am- It's easy to be fearful when companies move work to the cloud. But the simple fact is that there's more work than ever before to do to master all of Office 365. Just go looking! New OWA Maturing in Different Ways January 22, 2019 11:15 am- The new version of OWA is maturing and new features are turning up on a weekly basis. You can now schedule a Teams meeting from OWA and the prospect of joyful animations hang in the air. But only for Office 365 users as there's no sign that the new OWA will come to Exchange on-premises servers. Read More "Office 365 for IT Pros January 2019 Update Released"
Office 365 Network Performance (POC) Tool January 20, 2019 4:25 pm- Microsoft's new Network Performance Tool is a proof of concept for Office 365 tenants to check network connections to Microsoft's network and Office 365. The tool might help you understand more about your connection into Microsoft, but it won't fix any last mile problems. The Power of Amazon Reviews January 17, 2019 9:14 am- We're confused because people continue to buy the Kindle version of the older edition of the Office 365 for IT Pros eBook for $50 more than the current book. The only reason we can think this happens is the reviews the older book has. First Look at Teams for Frontline Workers (aka Shifts) January 16, 2019 9:05 am- The Shifts app is now available to Office 365 tenants worldwide. Hosted as a Teams app, the idea is that managers can build out and publish schedules for hourly-paid frontline workers, who can then view their hours and request changes. Using the Inbound WebHook to Post to a Team Channel or Office 365 Group January 14, 2019 10:22 am- It's easy to create a webhook connector to post information to a team channel or an Office 365 group. What might not be quite so easy is formatting the JSON payload. Here's how to use a template card to simplify the process. The Dangers of Cut and Paste Technology Coverage January 11, 2019 10:00 am- We all make mistakes - it's part of life. But it's sad that so many web sites and blogs pick up and repeat mistakes found in press releases and other material. Life would be better if we had more time to consider what we publish, but the speed of the cloud sometimes makes time hard to find. Planner Now Available in U.S. Government Cloud January 10, 2019 9:29 am- The Office 365 Planner app is now available for U.S. Government Cloud tenants. Only it's not the full Planner because some bits still have to be tested to make sure that they meet government standards. Service Domain Prefix Appears and Disappears in Exchange Online Cmdlets January 9, 2019 11:31 am- A change made to fix a problem in Exchange Online introduced another problem in that service domains started to show up as prefixes in the data returned by PowerShell cmdlets. Microsoft has reversed the change, but the way things happened creates some questions. Applying Autosignatures with Transport Rules January 8, 2019 11:39 am- Office 365 tenants can use Exchange transport rules to apply autosignatures to outbound email, including messages protected with encryption. You can even include some properties of the sender extracted from Azure Active Directory, and you can add an exception so that the autosignature isn't applied to replies. Using Exchange Session Identifiers in Audit Log Records January 7, 2019 10:49 am- Exchange Online now captures session identifiers in its mailbox and admin audit records that are ingested in the Office 365 audit log. That's interesting and useful, but how do you access and interpret this information on a practical level? Exchange Online Adds Message Access to Audited Actions January 6, 2019 4:36 pm- Exchange Online will soon capture audit records for any access to a message in a mailbox. Initially, the audit records will not be ingested into the Office 365 audit log, but that will happen in the future. MyAnalytics Spreads Its Wings to Teams and SharePoint January 4, 2019 9:24 am- Microsoft's announcement that MyAnalytics is available to many more Office 365 users is welcome. The technology interest in the announcement is the spread of coverage to include SharePoint Online, OneDrive for Business, and Teams. Apply Column Formatting in SharePoint Online with No Code! January 3, 2019 10:12 am- A recent update means that you can now apply column formatting for SharePoint Online lists and document libraries without the need to write JSON code. Adding Global Contacts for an Office 365 Tenant January 2, 2019 1:43 pm- You can use a public folder to store and share global email contacts, but a better approach is to use Exchange mail contacts. These objects show up in the Exchange GAL and OAB and are available to all Outlook clients (and some third-party clients too). The Handy Save for Later Feature in SharePoint Online December 30, 2018 10:53 am- The Save for Later feature gives SharePoint Online users a way to mark documents and news items so that they can easily follow up and read the full content of those items. The Trouble with Yammer December 22, 2018 4:54 pm- After being accused of bias against Yammer, I thought about whether this is true. But it's not bias - it is frustration that Yammer remains so detached from the rest of Office 365 six and a half years after Microsoft bought the technology. Largest Teams Deployment Reaches 170,000 Users December 21, 2018 10:46 am- Microsoft's CMO says that the largest customer deployment of Teams (Accenture) has reached 170,000 users. Numbers like this underline the success of Office 365's fastest growing application. Sending Email with PowerShell and Exchange Online December 20, 2018 3:32 pm- You can use the Send-MailMessage cmdlet in a PowerShell script to send mail messages via Exchange Online. And sometimes your IP address might be listed as a spammer, which is bad. All in all, authenticated client submission seems best. Sending Protected Email to Teams, Yammer, Groups, and Shared Mailboxes December 19, 2018 12:48 pm- Encrypted email is becoming more common within Office 365. Things usually flow smoothly when sending protected messages to email recipients, but other Office 365 recipient types like Teams and Yammer might not be able to handle protected email. Azure Active Directory Feature Bans Custom Words from User Passwords December 18, 2018 6:09 pm- Making sure that Office 365 user (and administrator) accounts have good passwords is a never-ending task. A new preview feature in Azure Active Directory helps by ensuring that users can't include common words specific to the organization (like its name) in a password. It's another piece in the puzzle to frustrate potential attackers. Teams Meeting Room Licenses Now Available for Purchase December 17, 2018 2:22 pm- You can now buy a Meeting Room license to connect Teams to a device in the room. The license allows the device to participate in Teams meetings. Searching for Encrypted Office 365 Information December 15, 2018 9:45 pm- Making it easy to protect Office 365 content with encryption is great, but it has some downsides too. One of the obvious problems that we have is that encrypted documents in SharePoint and OneDrive for Business libraries can't be found unless their metadata holds the search phrase. December 2018 Update Issued for Office 365 for IT Pros (2019 Edition) December 14, 2018 10:42 am- The December 2018 update for the Office 365 for IT Pros eBook is now available for subscribers to download. Teams Passes Slack: What a Surprise December 13, 2018 1:10 am- A survey found that Teams is now the second most popular chat application in large businesses and has put Slack into third position. But anyone who has tracked the numbers isn't surprised because Teams has been growing strongly for some time. Protected PDFs Now Generally Available with Azure Information Protection December 12, 2018 12:25 am- The Microsoft-Adobe initiative to support Azure Information Protection for PDF files has reached general availability. Things look good and the issues encountered in the preview are removed. You can store protected PDFs inside Office 365, but be prepared to download the files to be able to view them. Tracking the Managed Folder Assistant December 10, 2018 10:48 am- The Exchange Online Managed Folder Assistant (MFA) runs in the background on a workcycle basis to make sure that mailboxes are processed at least once a week. Most of the processing involves mailbox and Office 365 retention policies and runs smoothly, but how do you know what MFA has done? Report for Email Encryption in the Security and Compliance Center December 9, 2018 1:36 pm- The Office 365 Security and Compliance Center includes a report to detail encrypted email. The report is in preview. It's a nice insight into user activity, even if it has some glitches that need to be sorted out before it becomes generally available. What Office 365 Retention Policies Apply to SharePoint Online Sites? December 7, 2018 5:27 pm- Knowing how retention policies process Office 365 data can be hard to understand, especially if multiple policies are involved. Office 365 doesn't give a global view of how retention policies affect workloads, but here's how to use PowerShell to find out what policies process the sites in a tenant. Logos in Email – Another Way to Stop Spoofing December 6, 2018 11:59 am- Including a company's logo when listing or displaying email is another way to give users confidence that the email is in fact from that company. Business Indicators for Message Identification is a draft standard that might become generally used by all email clients. But for now. Microsoft has their own business profile "brand card" program, and that's where OWA gets its logos. Reporting the Connection Protocol Used by Outlook Mobile Clients December 5, 2018 11:02 am- Microsoft has refreshed the Outlook Mobile architecture. They suggest that you run some PowerShell to report clients connecting via the old and new architectures. Their code works, but we think ours is better. Including a Teams Channel in an Exchange Distribution List December 3, 2018 12:36 pm- Now that we know all about the different email addresses used by Office 365 Groups and Teams, the question arises of how to include a team channel as a member of a distribution group. As it turns out, there's a simple way and a more complicated way. Groups and Teams Have Different Email Addresses December 2, 2018 2:16 pm- Some recent questions in the Microsoft Technical Community show confusion about the email addresses used by Office 365 Groups and Teams. Here's our attempt to clarify. Azure Information Protection Client Supports S/MIME December 1, 2018 5:06 pm- The latest version of the Azure Information Protection (AIP) client supports the ability to associate S/MIME protection with an AIP label. Although interesting, it's a feature unlikely to be of much practical use to the majority of Office 365 tenants. Teams Upgrades PowerShell Module to 0.9.6 November 30, 2018 1:01 pm- Teams has released version 0.9.6 of its PowerShell module. You should upgrade to the new module because it fixes some bugs and allows administrators to manage any team, even when they're not a team owner.